BATON ROUGE — Is Mikiah Brisco the best female athlete in Louisiana high school sports? Probably so. 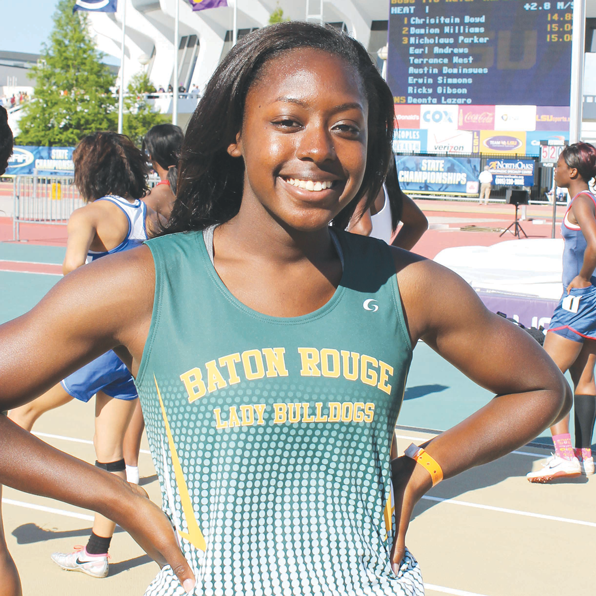 The Baton Rouge High junior led the Lady Bulldogs to the State 5A Track & Field Championships, and she did so in convincing style, breaking one state record and roaring past her competition in the other races. Altogether, she won four gold medals. Brisco set a new state record in the 110-meter hurdles at 13.87. The previous record stood for 16 years. She won the 100 meters in 11.55, 7/10ths of a second ahead of the next competitor. She ran the 100 only seconds after winning the 110 hurdles. She won the 200 meters in 23.85, just off the state record. And she anchored the 4×100 relay, which won with a time of 47.35, nearly a second ahead of No. 2 Scotlandville. For her exhibition, Mikiah Brisco was named the meet’s Outstanding Track Performer.